Playthrough of Assassin’s Creed 4 Black Flag with Live Gameplay and Commentary in 1440p high definition at 60 fps played on PC. 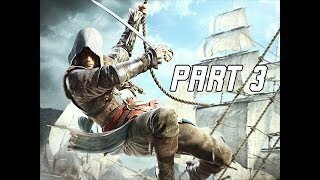 This Assassin’s Creed 4 Black Flag walkthrough will be completed showcasing every level, mission, boss, and story ending. Samples that were taken from Desmond Miles’ body in the moments after his death have allowed Abstergo Industries to continue exploring his genetic memories using the Animus’ newfound cloud computing abilities. The unnamed player character is hired by Abstergo Entertainment, from their Montréal headquarters, to sift through the memories of Edward Kenway, an eighteenth-century pirate, the father of Haytham Kenway and the grandfather of Ratonhnhaké:ton. Ostensibly, this is to gather material for an Animus-powered interactive feature film. In reality, Abstergo—the Templars of the present time—are searching for a First Civilization structure known as the Observatory, and are using Edward’s memories to find it.